Toulouse-Lautrec and the Stars of Paris opens with a selection of key works by Toulouse-Lautrec, including the artist’s first poster: the large and dramatic Moulin Rouge: La Goulue (1891, Metropolitan Museum of Art). 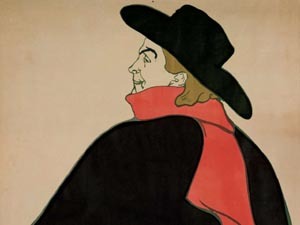 Commissioned by the infamous dance hall Le Moulin Rouge, it marked Toulouse-Lautrec’s entry into the foray of advertising and celebrity culture and set a new standard for poster design, radically synthesizing artistic devices from a range of sources, including shadow theater and Japanese woodblock prints. Toulouse-Lautrec and the Stars of Paris explores the artist’s enthusiastic participation in the celebrity culture of his day and how, to a remarkable degree, he defined it for generations to follow. In addition to his famous lithographic prints and posters, which distilled the defining gestures, costumes and expressions of “les stars” of the day into instantly recognizable images, the exhibition features never-before-displayed early drawings and a selection of paintings by Toulouse-Lautrec. Paris was the center of nightlife and spectacle in the late 19th century, a moment immortalized in evocative posters, prints and paintings by Henri de Toulouse-Lautrec (1864–1901). The artist’s extraordinary attention to the performers, dancers and actors of Montmartre—the heart of the city’s bohemian nightlife—is the focus of Toulouse-Lautrec and the Stars of Paris, on view in the Ann and Graham Gund Gallery from April 7 through August 4, 2019. The exhibition of approximately 200 works is a collaboration between the Museum of Fine Arts, Boston (MFA), and the Boston Public Library (BPL), drawing on both institutions’ extensive holdings of rarely displayed graphic works by Toulouse-Lautrec. It also includes a selection of loans from the Harvard Art Museums, the Houghton Library of Harvard University and the Metropolitan Museum of Art, as well as local private collectors. Works by his contemporaries, including Pierre Bonnard, Mary Cassatt, Edgar Degas, John Singer Sargent and James Jacques Joseph Tissot, are also incorporated throughout the galleries, as well as recently restored period films, music, instruments and fashion accessories. The exhibition is accompanied by an illustrated catalogue produced by MFA Publications and a range of public programming offered at the Museum and the BPL’s Central Library and 25 neighborhood branches. Members	Free Adults	$25 Seniors (65+)	$23 Children 6 and under	*Youths 7–17 admitted free weekends, weekdays after 3 pm, and Boston public school holidays; otherwise admission for youths is $10.